Body Contouring After Weight Loss is one of the most popular procedures performed at Dr. Avi Islur’s cosmetic practice. Losing weight (at any age) is a lot of work! Sometimes, after all that hard work to lose the weight, we are left with unwanted side effects such as loose overhanging skin, stubborn fat, and stretchmarks. That’s where Body Contouring After Weight Loss comes in to take your weight loss results to the next level. 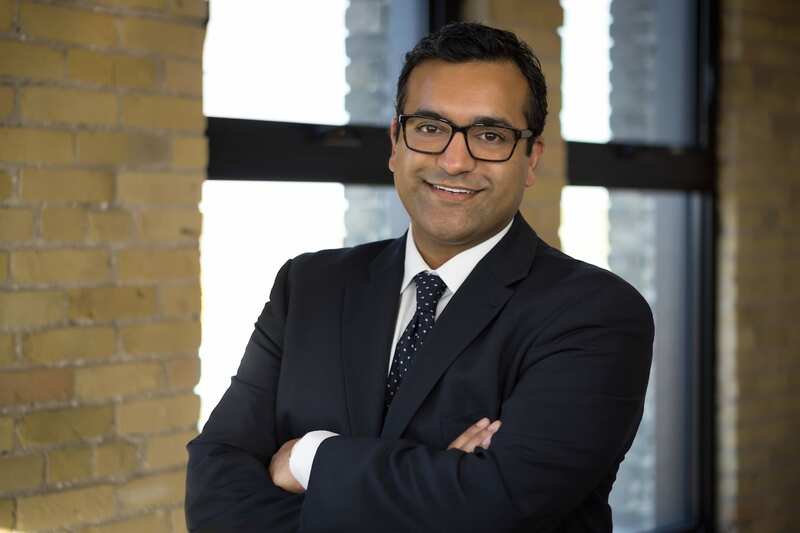 Dr. Avi Islur’s active cosmetic surgery practice is growing with out of province patients who travel across Canada and the U.S for Body Contouring After Weight Loss in Winnipeg, MB. If you are an out of province patient, please let us know so we can accommodate an appropriate time for your consultation and surgery date. What Can Body Contouring After Weight Loss Do For You? Body Contouring After Weight Loss can dramatically improve your comfort and appearance after weight loss. You worked very hard to lose the weight, now it’s time to enjoy it. Significant weight loss through diet and exercise or following bariatric surgery (gastric bypass or lap-banding surgery) may result in loose and excessive skin which hides the results obtained by your weight loss. 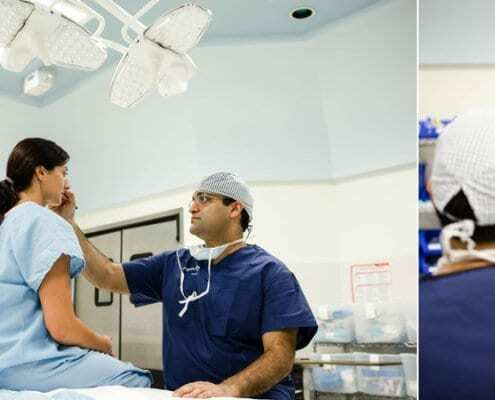 Surgeries are usually staged over several months to a year with multiple surgeries combined at the same time. Body Sculpting via Liposuction maybe required to enhance and improve appearance. Body Contouring After Weight Loss is usually performed on an outpatient basis but may require admission to hospital. Surgery is performed under general anesthesia in 3 to 5 hours. Your Body Contouring After Weight Loss surgery will be custom tailored to your unique needs, individual results and recovery instructions may vary. With extensive specialized training and experience in microsurgery and body contouring, Dr. Avi Islur can tighten and tone targeted areas to give your body a firm, smooth and contoured shape. Which Cosmetic Procedures Will Be Included In My Body Contouring After Weight Loss Surgery? Your Body Contouring After Weight Loss surgery will be custom tailored according to your desired aesthetic results. 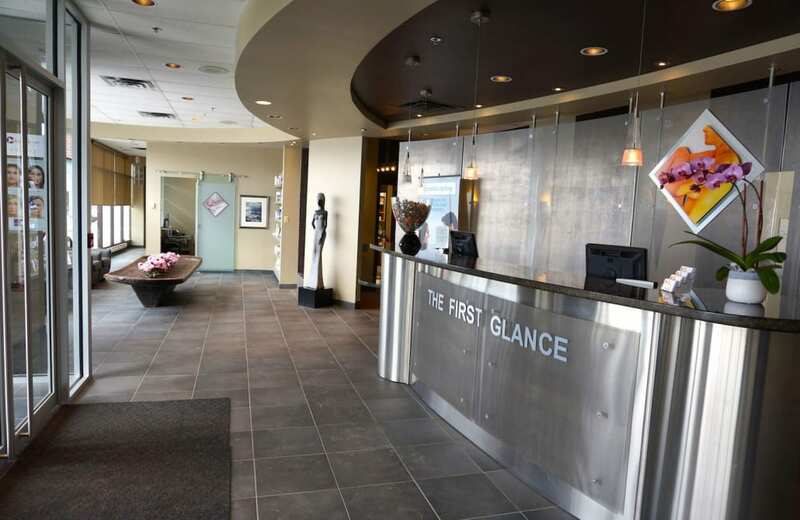 During your initial consultation with Dr. Avi Islur you will address your areas of concern. From there, Dr. Avi Islur will discuss all of your surgical options in detail and you can choose which procedures you are most interested in. Multiple cosmetic procedures can be performed in one surgery, however, there is a limit as to how many cosmetic procedures can be performed at the same time. If you are interested in having multiple cosmetic procedures performed during one surgery, you can address this in detail with Dr. Avi Islur during your initial consultation. A panniculectomy can remove your unwanted, overhanging, loose excess skin that is located on your abdominal area. 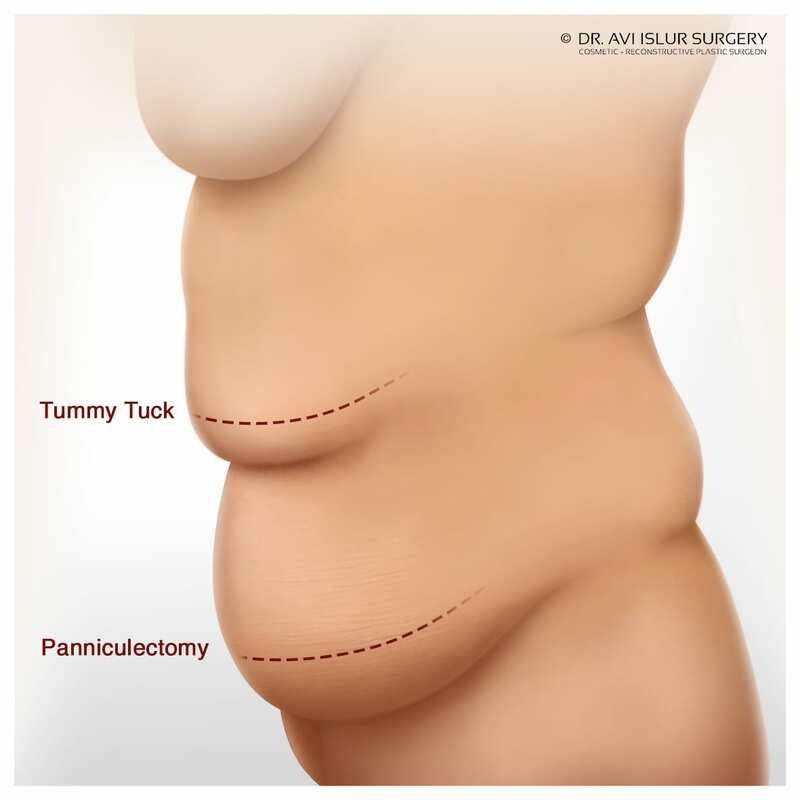 A panniculectomy differs from a tummy tuck because it does not include a change in the position of your belly button or pulling up of the pubic area. 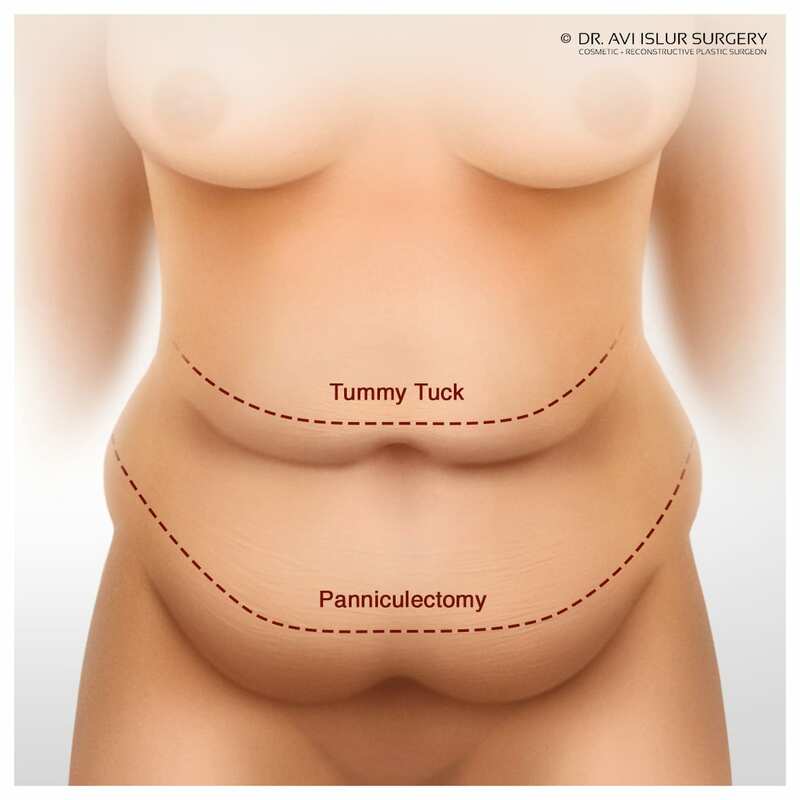 The scar for a panniculectomy is similar to a standard tummy tuck, the incision lines are located at the junction of the pubic area and abdomen and extends laterally along the thigh and abdomen. A panniculectomy can effectively eliminate rashes, ulcerations, moisture and hygiene issues but does not include cosmetic body contouring. This may be an option for you if you are considering correcting the issues mentioned above, but a panniculectomy is not the right fit if you are interested in further cosmetic body contouring. A panniculectomy can be performed alone and may be covered by provincial health care plans. To get an approximate cost of your Body Contouring After Weight Loss, call Dr. Avi Islur’s Patient Coordinator at the First Glance Aesthetic Clinic & Surgery Centre (204) 813-0305. An exact quote will be provided after your in-clinic consultation with Dr. Avi Islur. The exact cost of your surgery will be determined by your unique surgical requirements. Quotes are valid for 6 months from the date they are printed. Will I Save Money If I Get Tummy Tuck, Liposuction, and Breast Surgery Done At The Same Time? Yes, you will save money if multiple procedures are performed at the same time because only one anesthetic will be required for your operation. If Dr. Avi Islur performs your tummy tuck, liposuction, and breast surgery on different days, that means a board certified Anesthetist, Dr. Avi Islur, and his team of medical professionals would have to attend two operation dates. Only one anesthetic is required per surgery date so the cost savings is passed on directly to you. It’s important to understand that multiple cosmetic procedures can be performed in one surgery, however, there is a limit as to how many cosmetic procedures can be performed at the same time. This will be discussed in detail during your initial consultation with Dr. Avi Islur. At your consultation, Dr. Avi Islur will spend as much time as you need to discuss your body contouring surgery after weight loss and will answer all of your questions. For your convenience, Dr. Avi Islur has provided answers to the most common questions he hears about body contouring surgery on our FAQ page. 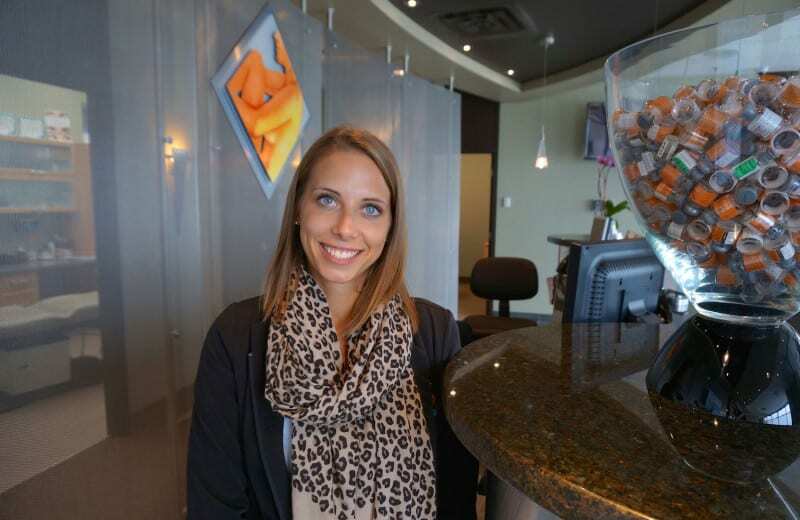 Please note that post weight loss surgery is custom tailored to each patient, individual results may vary. Get a bird’s eye view of what you can expect pre and post weight loss surgery. Whether you’d like to book your weight loss surgery or you’re just getting started with your research, we’re ready to help. Don’t miss out on your preferred surgery date, call us to reserve your consultation with Dr. Islur today.